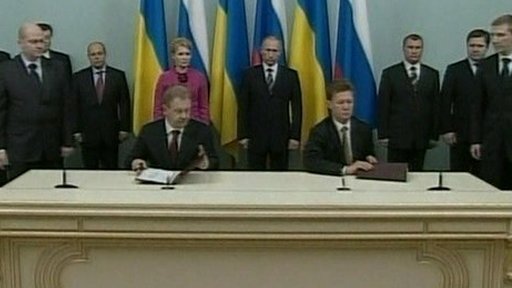 Russia and Ukraine have signed a 10-year gas deal, which their prime ministers say will bring their long-running dispute to an end. Russia says its energy company Gazprom has been told to resume immediate gas flows to Ukraine and Europe. The EU has given a guarded response, saying the crisis would only be over once gas supplies resumed. Millions of Europeans have been without heat because of the dispute, which began on 1 January. Ukrainian Prime Minister Yulia Tymoshenko said the transit of Russian gas to European consumers would begin as soon as the gas reached Ukraine. During a joint news briefing with Russian Prime Minister Vladimir Putin, Ms Tymoshenko said there would be "no delays" in supplies from the Ukraine side. Officials say the restored gas shipments could take up to 36 hours to cross Ukraine and reach European customers, the Associated Press reports. Ms Tymoshenko had flown to Moscow on Monday for a meeting with Mr Putin after the two countries' gas companies, Gazprom and Ukraine's Naftogaz, succeed in hammering out the final details. Under the deal they outlined, Ukraine will start paying for Russian gas at "European" rates from 2010 while equally charging Russia "market" rates for transit. Ms Tymoshenko says Kiev will pay less than $250 (£175) per 1,000 cubic metres of Russian gas in 2009, although final confirmation of the agreed price has not been issued by either Ukraine or Russia. Last year, Ukraine paid $179.50 per 1,000 cubic metres, while the current average European price is more than $400. The BBC's Rupert Wingfield-Hayes, in Moscow, says Prime Ministers Tymoshenko and Putin seem to be back on good terms again, a change of tune from a few days ago. The reputations of Russia, as a gas supplier, and Ukraine, as gas transit country, have been damaged by the affair, our correspondent says. The European Commission says it wants to know a precise time when gas deliveries will begin. On Sunday, before the deal was signed, Czech Industry Minister Martin Riman, whose country currently holds the EU presidency, welcomed the agreement, but urged caution. "Over the past few days we have seen several similarly hopeful moments. The only thing that counts for the EU is the resumption of gas supplies." Russia switched off gas supplies to Ukraine in a row over payment. Transit supplies dried up within a week as Russia accused Kiev of stealing gas meant for other countries.